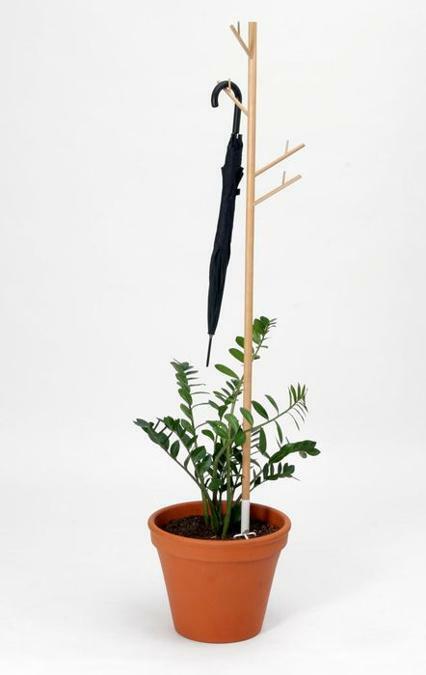 ReCOVER coat rack with hooks for jackets, hats and umbrellas is a creative green design idea that saves water and electricity on watering indoor plants while keeping an entryway floor dry and safe. Ideal to use in wet climates, the coat rack design is simple and elegant, blending functionality with green living ideas. 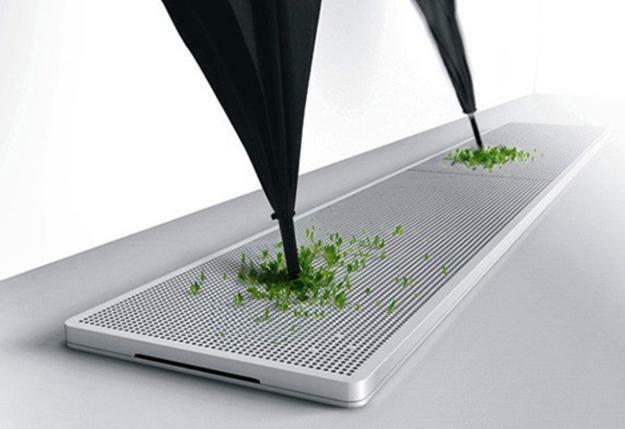 Made of wood and a plant container, the rain coat helps to collect and use rain water for watering indoor plants, decorating entryways with a unique and interesting green item. If you live in a country with lots of rainy days, this coat rack offers a nice umbrella storage idea for creative, practical and eco friendly entryway designs and foyer decorating in eco style. The amazingly simple green design idea is from designer Peter Bristol and design studio Teracrea The reCOVER www.teracrea.com is a n innovative coat rack that brings the obvious green living idea into eco homes. Designer Peter Bristol blended form, eco friendly material with function in a clever way, creating an original, practical and attractive eco -friendly products for modern homes. 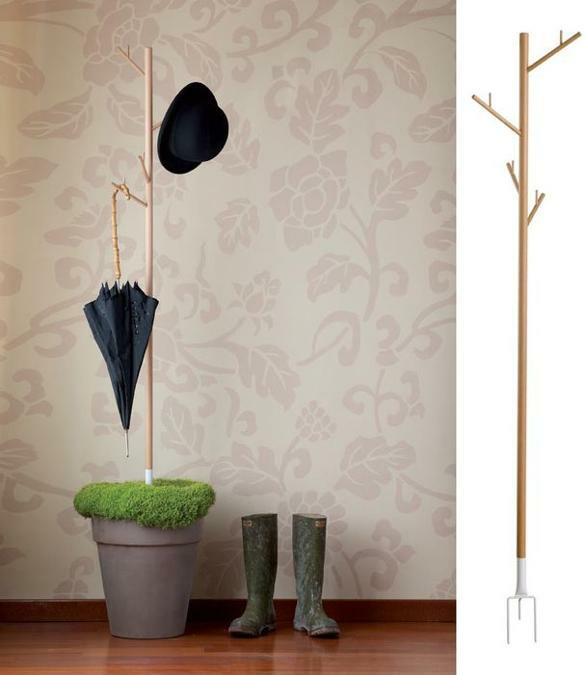 The wooden coat tree features a small fork on the bottom, which is inserted into soil in a planter and works well for drying coats, hats and umbrellas and watering indoor plants, perfect for stress-free foyer decorating. 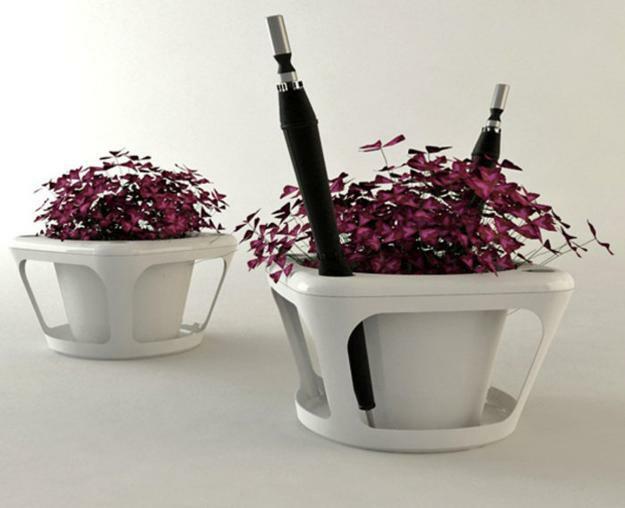 The original, playful and green design idea is great for creating better environment and supporting green living style. Here are a few interesting green design ideas that encouraged to add indoor plants to entryways designs and foyer decorating in eco style.